Those with control over their lives and their time are able to take action on a consistent basis. 1. Realize that nothing changes until your behavior changes. Visualization and positive self-talk have their place, but they’re effective only if they help to make your behavior change. You can try to wish your way to a new Bentley, or to make a million dollars by aligning your chakras with the universe, but it won’t happen unless you’re actually doing something different. Understand that a consistent change in your behavior is the key to real change. 2. Know the outcome you desire. It’s not easy to take action if you don’t know what you’re attempting to accomplish. Be clear on your intention. Take the time to determine what you want to accomplish. Where do you see yourself in 5-10 years? What actions can you take today to move in that direction? 3. Start by taking small steps. Do you want to jog for 60 minutes each day? Get started by jogging for one minute each day. You won’t get in shape by exercising for only one minute, but you will develop the habit of getting out the door each day. After a week, up the time by another minute or two. After 4-6 weeks, you’ll have developed an exercise habit and can begin to exercise for real. Does it seem like that schedule is too easy? Good! How much running did you accomplish in the previous 12 months? There’s nothing wrong with easy, provided you’re patient and can see the big picture. 4. Limit your planning time. Those that are slow to take action love to plan, but the best plans are worthless until they’re executed. While you’re trying to work out the fine details, everyone else is already taking care of business. There’s no reason to be hasty, but set a limit on how long you’re going to strategize before you actually do something. 5. Use rewards wisely. Small, meaningful rewards can help you to get off the couch and get busy. Decide on a few rewards and when you’ll receive them. 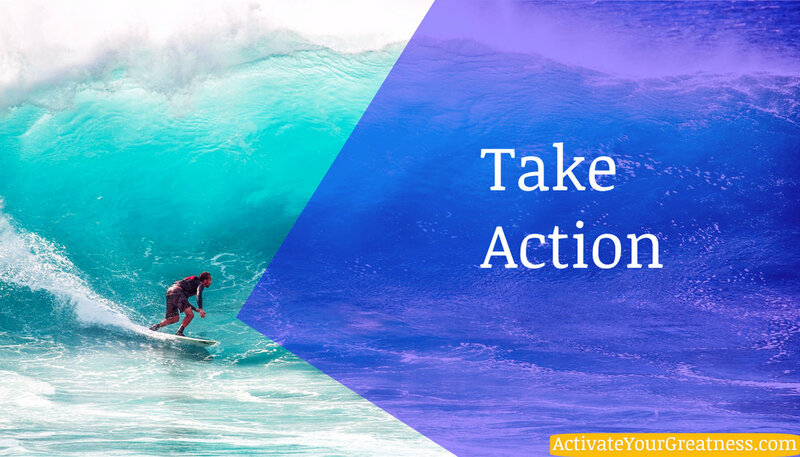 Get excited and begin taking action. When you’ve earned a reward, enjoy it. 6. Get started early in the day. If you can accomplish something worthwhile before 9 AM, you’ll be motivated to do even more during the rest of the day. If you fail to do anything substantial by noon, you’ll feel bad about how you wasted the morning. Then you won’t feel like doing anything in the afternoon. Then you’ll let yourself off the hook by telling yourself that you’ll get twice as much done tomorrow. Many people make this process a habit. Avoid becoming one of these people. Take a close look at the most successful people you know. Notice that there’s nothing exceptional about them. They aren’t smarter or more capable than you. But they do manage to get things accomplished each day by taking action consistently. The good news is that you don’t have to be spectacular to be wildly successful. You only need to learn how to avoid wasting your precious time. Consistent action is the key to wealth, weight loss, strong relationships, and anything else that matters in your life. Joe Mitchell Esquire is a High-Performance Coach, who has logged over 35 years of in-depth study of personal and spiritual development. In his studies, he has done hundreds of self-development courses, spiritual retreats, and health-related workshops. He is a certified yoga teacher, meditation teacher, EFT Practitioner, NLP Practitioner and a graduate of three coaching academies. He was also a member of a religious order for 5 years. In 2016, after a 20-year career as a criminal and personal injury attorney, he decided to turn his heart's passion into a career as a Success Coach, Motivational Speaker, and Trainer. For information on Joe’s programs and high-performance videos and writings, and to reserve a free High-Performance Strategy Session, book your consultation now.